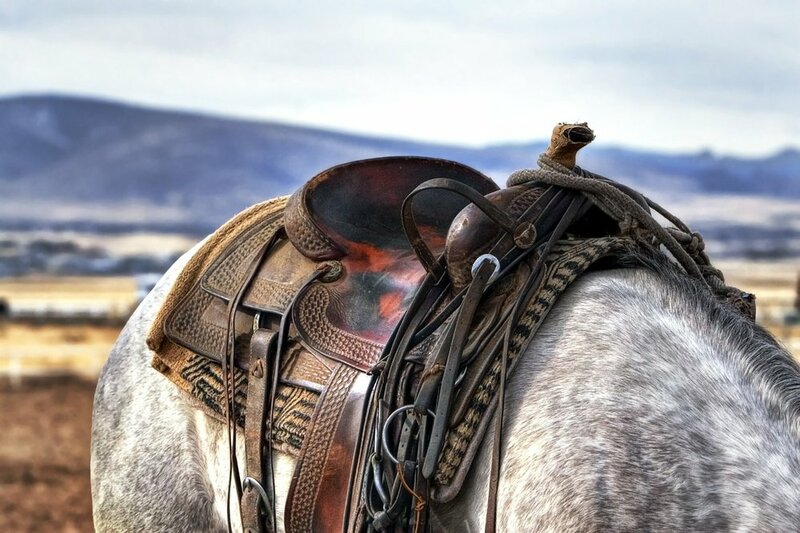 A Saddle Horse, for Riders — and Everyone Else! For some time I’ve been promising several of you that I would make a ‘horse’ to go with the saddle that’s been sitting rather forlornly in the corner of the Midhurst teaching studio. I’m pleased to say that after a tiring but quite fun day yesterday this has now been completed. Recently (and rather to my surprise) horses have become part of my life. This has turned out to be an unexpectedly wonderful thing for several reasons beyond the obvious one that they are fascinating characters and endlessly amusing companions. In particularly I have discovered, like many before me, that horses are very accurate mirrors. They are completely honest in their responses: if we care to listen they show us with great clarity what we are doing that we might not wish to be aware of — and what they think of us and our behaviour! In addition they offer a great way to work with principles such as intention, allowing and saying ‘no’. It’s not a coincidence that many Alexander Technique teachers ride, and that the Technique is well known and valued among open-minded horse people. 1. Balance matters. As a child and young man I was a bit of a ‘klutz’, being somewhat dyspraxic and poorly co-ordinated. Several things I have done over the years have helped to resolve this (the Alexander Technique, of course, and also primitive reflex work) so it was a revelation to get on a horse for the first time in 35 years and to feel immediately comfortable there, rather than experiencing the noble beast as a wretched and precarious perch! Instead of fighting to stay on I was responding freely to the movement. I felt very much at home. The ability to balance openly and freely in an upright posture is one of the most fundamental things to differentiate humans from other animals. The evolutionary development of this ability left our arms—and hence our hands—completely free; balance was therefore a pre-requisite for the development of human culture, and for all the achievements (and problems) which have followed. For many of us in the modern world this sense of balance has atrophied — often to an extent we may not be aware of. This is a pity because being able to balance well—even in the mundane activities of life—gives us an inner feeling of safety, frees our limbs up for activity, and opens the door to unexpected experiences. 2. It’s important to take care of yourself. You don’t need to be around horsey people for long before you realise that many of them pay a high price for their passion! Riding horses is very physical and places a lot of demands on the body (even before we factor in the after-effects of falling off!). These demands need to be met with intelligence and consciousness if we are not to end up with pain and muscular skeletal problems. This sort of deterioration can be exacerbated by old-fashioned teaching methods which encourage what could be called 'fake good posture'. This is where we hold on and tighten to hold ourselves in what looks like a 'correct' position, rather than releasing to allow our innate postural support system to function as it should. When we learn to let go and be supported, rather than frantically trying to create support through holding on, we find that not only are we less likely to experience constant low level aches and pains, or liable to injure ourselves (though that’s always a risk with horses!) but we also become more ‘in tune’ and responsive to the horse. Excess muscular tension acts as a barrier between horse and human (in the same way as it does in human to human interaction). It limits not just our physical, but also our emotional, responsiveness. Almost literally it builds a wall between ourselves and the rest of the world. 3. Honesty is the best policy. Horses don’t lie! They are always expressing one hundred percent who they are in any given moment. They don’t play games or hide their true nature like humans often do. Of course sometimes when we are dealing with the complexity of human life it is appropriate and necessary for us to exercise discretion in how, what and where we express, and when we forget this we may be unintentionally destructive to ourselves or to others. But horses can remind us that to be healthy and happy we always need to come back to where and what we truly are, to be ourselves in the present, and allow what is there to flow freely again. 4. Magic happens in the space between clarity of intention and letting go. If we want to live with a feeling of grace and effortlessness we need an intelligent intention or image of what we are trying to achieve (meaning one that is in accord with our structure and design), coupled with the ability to get out of our own way. Our body-mind can manifest a deep intelligence which, given a chance will organise things with far greater subtlety and skill than we (by which I mean the ‘little I’ sitting in our head working the controls) can ever hope to achieve by our own efforts. When we learn to get out of the way of this deep intelligence, and allow it to carry out our well-conceived intentions, everything flows with freedom, balance and poise. Horses are great at teaching us about this. Because they don’t lie they reflect back to us what we are doing and who we are in any given moment. If we tense up and become aimlessly controlling, they tense up too and become discombobulated. If we try to force things rather than directing the flow of what’s happening they push back. If we have unclear or contradictory intentions they will not be able to do what we want and will do what we are actually (unconsciously) asking of them. So working with horses we are really working with ourselves, discovering how we get in our own way, and how to get out of it again. If we approach being with a horse in this spirit we start to become better at saying ‘no’ to the wish to respond to challenging situations with holding rather than release. We become wiser and clearer in our intentions. And in time we might find that our intentions themselves begin to arise less from the ‘little I’ and more and more from the place of deep intelligence within us. But that’s another story…. How good is your sense of balance? Many of us are so caught up with adult responsibilities that we no longer find time to move in a playful and exploratory way as we used to when we were younger. As a result our ability to balance can become compromised to an extent which may be a bit shocking once we start to experiment with it again! The Alexander Technique aims to restore the body’s natural postural and support systems to their proper functioning. Because these systems all rely to some extent on our sense of balance, I encourage my pupils (and anyone else who will listen!) to play balance games of one sort or another. As well as honing our sense of balance this also encourages our postural muscles to work harder, which tones and activates our ‘core’ in a fun and natural way without need for special exercises. In addition, balance games are a great way to play with ‘letting go’ and ‘allowing things to happen’. When we feel out of balance and are in fear of falling we tend to tense up. However this doesn’t help us—and is in fact MORE likely to make us fall. Playing balance games is a great way to learn to withhold consent to the habit of tightening in the face of stress. Finding this ability to stay calm and open in response to worry is a key part of the Alexander Technique (and of living well in general) so these sorts of activities can really speed up the process of learning and applying the technique in our lives. Below are some activities you can undertake to help develop your sense of balance. The majority of these require you to purchase some simple items. However this is an investment which will be well worth it in terms of enjoyment, and the improvement in overall health and functioning that is likely to result. Obviously there is some risk involved in any balance activity, so exercise common sense and make sure you are attempting an activity that is a sensible match for your current fitness level and abilities! Note: I have pictured some specific products in this article as examples, but I am not really recommending one brand over another—most of the items are available from several different companies and I suggest you shop around. If it is a while since you have played around with your sense of balance you might be shocked at how much it has atrophied while you have been thinking of other things! Try standing on one leg. Easy? Then try doing the same with your eyes closed. The eyes are an important source of information for the balance system so when we remove them it forces other parts of the system—for example the vestibular canals and the proprioceptors—to play a larger role. Now try walking along a straight line placing your feet one in front of the other. Again if that is easy try it again with your eyes closed. If your balance is rusty then doing simple exercises like these every day for a few weeks will help to start tuning it up again. When you start looking there are all sorts of everyday possibilities to further improve and practice your balance. Even a walk in the woods or the local park can give lots of opportunities to let your inner child out to play and to reconnect with skills of balancing and movement you may have forgotten! Taking things a step further, there are several types of balance board which can be used to take your balance practice to the next level. One of the simplest types is a round board on a semi-spherical rocker. These are widely used for injury rehabilitation so are available in various sizes and levels of difficulty. N.B. these put a lot of pressure on the point where the ball meets the floor and they may damage wooden floors, so be careful! Moving up a notch we have several types of board which are free to move in multiple ways at once. The simplest ones involve a roller. These can be quite tricky to begin with, and there is a danger of the board suddenly flipping out from under your feet and sending you flying. For this reason it is important to make sure you practice with clear space around you so that if you fall you won’t hit anything! It’s also a good idea to have something solid to hold onto at about waist height until you gain confidence. If necessary you can slow things down by beginning on a carpeted floor before graduating to a solid surface. The next step up from roller boards are boards which balance on a ball. These have a recess underneath which helps to limit the ball’s movement and makes it less likely that it will fly out. They can look a bit daunting, but they are not as difficult in practice as you might expect and they are more flexible and fun than the roller boards. My favourite is the ‘CoolBoard’ (see the video below). The most difficult part in learning to use these is getting balanced on the ball in the first place. Once you are up there it is not too hard to stay up, especially if you choose one of the smaller and ‘slower’ balls to start with. For most people a few minutes practice a day for a couple of weeks will have them easily up onto the ball and moving about quite confidently. These are great fun if you have the space. It is possible to get small tight-rope setups to use at home, however they tend to be expensive and unwieldy. As an alternative I suggest using a slackline, which is much cheaper and easier to set up (see my article on slacklining and the Alexander Technique here). As well as being more convenient, slacklines can also be more fun than tightropes. The bounciness of the line is an added challenge, and is addictive. It also allows the more adventurous to learn tricks. If you have access to two reasonably substantial trees you can set up a simple line between them. If you don’t have trees but you have some space outside there are various ways of setting up a line with—anchors and A frames. This takes a bit of work but will give you a long lasting set up. You can find instructions on how to do this here. Finally there are setups which allow you to have a small line indoors without too much expense. These are a little shorter than is ideal, but still allow you to play around if space is limited or it is too cold to be outside. Of course if you have the time and opportunity there are many sports and activities in which balance plays a key role. Horse-riding, surfing and windsurfing, and circus activities like unicycles etc. all help to tone the balance system and keep you fit in a fun way. Any of the above activities should make a noticeable improvement to your balance and quality of life if undertaken regularly. A few minutes every day is better than a splurge once a week! With this sort of routine even activities which seemed impossible at the beginning can be mastered fairly quickly. Have fun!